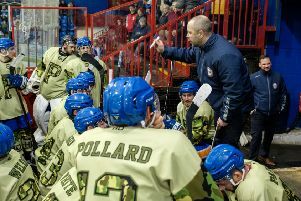 Peterborough Phantoms player-coach Slava Koulikov has warned his fringe players and future prospects not to waste the opportunity to impress this weekend (17/18 January). The city club complete their fixtures in the much-maligned English Challenge Cup competition with two away dates against lower-level opposition. They travel north of the border to Dumfries to take on Solway Sharks on Saturday (7pm) before calling at Blackburn on Sunday (5.45pm). Phantoms became the first English Premier League side to slip up against an English National League outfit when beaten 5-4 by Solway on home ice last weekend and Koulikov does not expect a repeat. He said: “This is the time for players currently on the roster and those who hope to be on it in the future to impress. “They need to stand out against ENL teams and that certainly didn’t happen last Sunday. “It looked like we thought it would be an easy game and were unprepared, but I hope I will see a lot more from certain guys this weekend. “Solway clearly enjoyed their win last weekend and I am sure they will want to beat us again back at their own rink. “Blackburn will also have seen our result last Saturday and will fancy their chances on Sunday as well. Koulikov will again rest several senior players while boosting his roster with members of the Islanders and Under 18 teams.